Corny dogs, carousels and car shows, oh my! 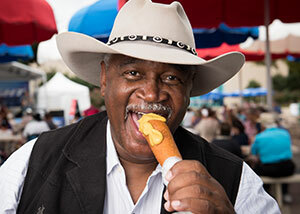 Your Texas State Fair experience is not complete without having a Fletcher's corny dog. This state fair favorite has been selling its famous corny dog since 1942 and continues to serve new and loyal customers every year. They're hand dipped and fried to perfection – it's impossible to only eat one. Add a little mustard, and you've got the perfect combination. There's also a vegetarian option – the veggie dog and a jalapeno cheese corny dog for a little more adventure to your taste buds. Fletcher's are sold at seven locations on the fair grounds, including one at the Midway and one right near Big Tex. This fried food favorite is only sold during the fair season, so get 'em while you can! And if you want nutritious, check out our guide to Eat Healthy at the Texas State Fair. 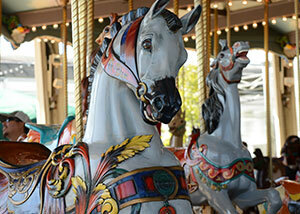 After overindulging on fair food, embrace your inner child by taking a spin on the Dentzel Carousel. The carousel at the Midway, a huge entertainment zone, has been a fair staple since the 1950s and is a great ride for kids and adults. The Midway features more than 70 rides like the Thrillway and the Texas Star Ferris wheel, as well as tons of games to keep the whole family entertained. It's the largest new car auto show in the Southwest, so car enthusiasts are in for a treat! Check out some of the newest and hottest cars on the market, with more than 400 of the latest models showcased at the auto show, taking place during the Texas State Fair. Cars are housed in two indoor buildings with both foreign and domestic vehicles featuring brands like Ford, Jeep, Toyota, Hyundai and many more. For truck lovers, there's an entire outdoor Truck Zone just for you. With 175,000 square feet of outdoor space dedicated to trucks only, the space features the newest models from Chevrolet, Ford, GMC, Nissan, Ram and Toyota. Interested in taking a test drive? Chevrolet Ride and Drive is your chance to hop in some of Chevy's hottest cars for the ride of your life. Featured cars include Corvette, Camaro, Silverado and Tahoe, just to name a few. Selfies speak a thousand words! Car selfies are the best – have a seat in your favorite new car at the auto show for great selfies that will make all of your friends jealous. You can't leave the fair without taking a selfie next to the State Fair icon, Big Tex. After all, he is the tallest cowboy in the world so don't miss out on an awesome photo op!